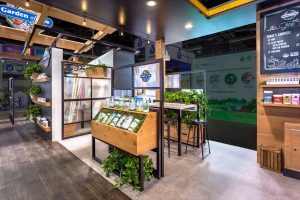 Trade show industry trends encompass everything from emerging technology, advances in content presentation, and new uses of pattern, material, finish, and color. Many of these trends are transferrable to different industries, spaces, and budgets. 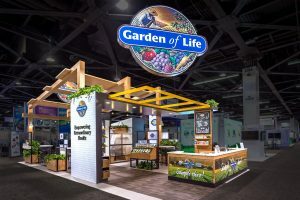 3D Exhibits‘ Creative Marketing Manager, Cole Hauschildt, shares with Color Marketing Group in this online interview and in an upcoming presentation, some trade show industry trends you will want to incorporate into your next exhibit. 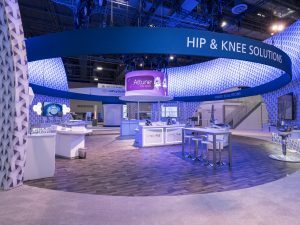 Las Vegas, NV – AAOS 2019. Photo by © AAOS/Todd Buchanan 2019. What are the challenges in keeping brand color consistent when translating to exhibit graphics? Different challenges present themselves when keeping brand color consistent across a trade show exhibit. Many times, there is a fine balance between brand colors, theme or campaign colors, as well as different product brands. In addition to this, extra precaution needs to be taken when preparing colors and graphics for different substrates, i.e. direct to Sintra plastic vs. printing on clear Plexi vs. printing on fabric. What color, material, and finishes are trending for exhibits? More and more we are seeing the use of earth tones and wood grain throughout many different industries. Companies are moving away from the sterile white and blue environments and focusing on creating a warmer, inviting presence in their space. There is such a large push towards an environmentally friendly initiative that the use of earth tones just makes sense on the show floor. Some companies are even moving away from using laminates in their exhibits by using wood veneer and even reclaimed wood. In addition to earth tones, there is a much more robust use of printed textures being used in trade show exhibits. Printed fabric has been used for some time now but the advances in printing are allowing larger format textures to appear seamless across even larger surface areas. We are also seeing digital content replacing the use of material finishes. High definition LED tiles can be manipulated to appear almost like a flat, printed graphic. 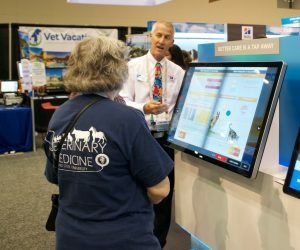 This use of digital content creates a whole new realm for trade show exhibits, where content can change easily per show or rotate throughout the day with out the incurred expense of reprinting graphics. 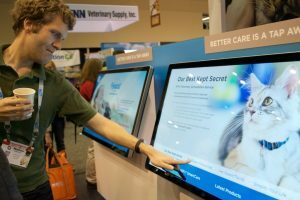 What are the top 5 things that are important to transforming trade show booths into engaging marketing experiences? 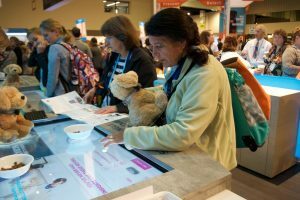 How does social media create an engaging booth experience? Different types of social media activations are becoming more and more prevalent. Engagements within the exhibit ask attendees to post to social media using a specific hashtag in order to receive a giveaway. 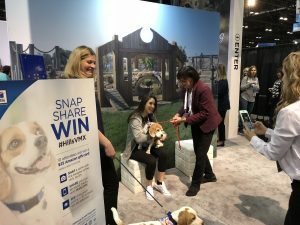 This is great because it creates a word of mouth scenario that attendees discuss on the show floor…its almost-free publicity. 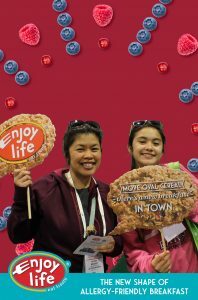 Other activations have been used that simply create an “Instagramable” moment for attendees. This is something that makes them want to take a photo and share their experience. We’ve seen everything from large sculptures to photo-opp walls to edible selfie cookies. What type of experiences are Gen Z audiences looking for vs Baby Boomers? How do they differ? 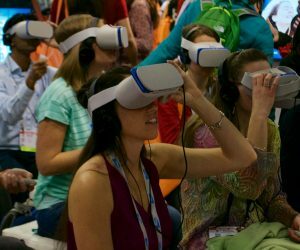 Gen Z is increasingly become the main target audience at trade shows. They are looking for ease of entry, no pay-to-play, and self-guided learning scenarios. This audience already has key data and knows about the product or solution. They may be more focused on a company’s environmental initiative and their brand presence rather than features and benefits. Baby Boomers want the facts, they don’t want to be oversold. To them it’s all about the benefits and cost savings. Any experience should be much more tactile than digital. Relationship building is a key factor in engaging and selling with this audience. What is the end marketing goal of each of the campaigns? Is it just getting visitors to the booth or is it more than that? How do the campaigns “close the deal” so to speak? Every campaign has a different story and different goal. 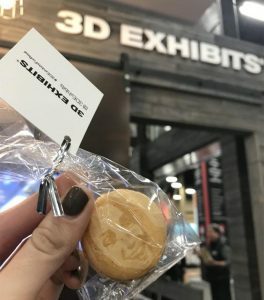 Some campaigns are created to drive traffic to the exhibit while others are focused on solely educating attendees on new products. A great campaign will focus on driving traffic, educating attendees, engaging visitors, and leaving a lasting impression. The campaign itself should be easily accessible to attendees as to minimize confusion and create a clear message. Companies are always looking for different things and all have differing approaches on how to drive sales, nurture leads, and engage attendees. One of the most important things to consider when building a campaign is how it will affect the overall post-show follow-up with attendees. Gathering information at the show and then using it to personalize sales calls after the show is the best way to “close the deal”. How does 3D Exhibits assure that the physical color samples (for a color company) do not shift color in the booth lighting? At 3D Exhibits the most important aspect is to ensure that the client is happy with the use of color. We match every graphic against the strictest Pantone matching processes and coordinate with our vendors in helping calibrate their various printing methods. While we check-in and proof our graphics under 5000K true daylight, we also match to dimmer and harsher lighting situations often found on the show floor. There is no true guarantee to color appearance at different trade shows however, as there is no 100% effective way to plan for the different lighting scenarios that a single graphic will experience at each trade show. 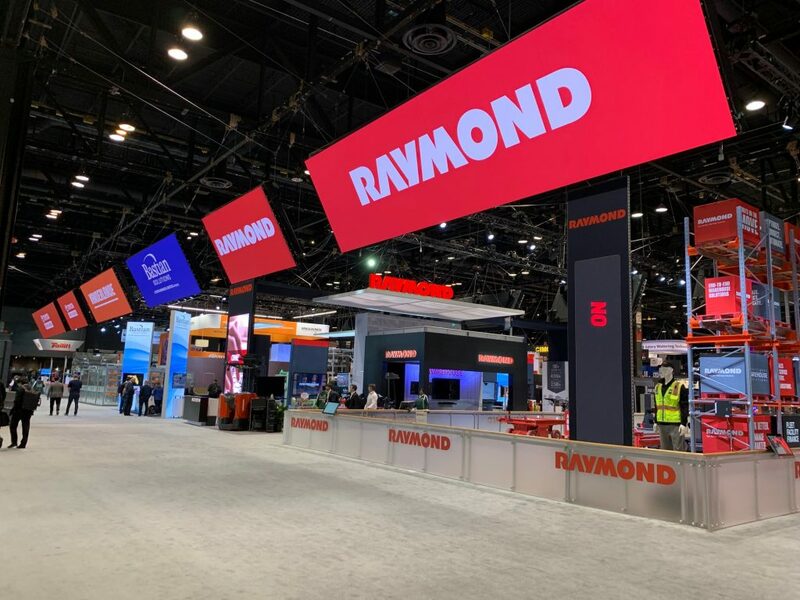 These shows take place in different halls…all with different color temperature lighting, exhibit lighting rigs, reflections from LED panels, competitor exhibit lighting, etc. This is why we match in various conditions to ensure the client is happy and their brand guidelines are upheld. 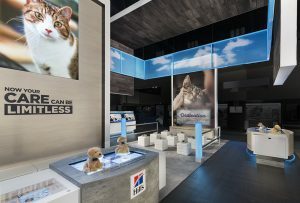 How do exhibit companies assure that the colors in the digital brand visuals in the booth present in the correct colors? (i.e. color calibration at the show for the monitors in the show’s ambient light? Very similar to our check-in process for physically produced graphics, we ensure all monitors are calibrated in house before sending to a show. Once at the event, every monitor and led tile is synced via an onsite technician to ensure even light and color distribution across the many forms of digital mediums. Many of the new LED tiles work wonders in compensating for ambient lighting, allowing the brightness to be calibrated so that visuals look clean and crisp, without the harsh “LED glow” we’ve become accustomed to seeing. New trends in the trade show industry are emerging all the time. While different industries can see a year or two of specific trend “fads”, we’ll take a look at some of the newest emerging trends from shows such as RSNA and CES…above all, we’ll look into the use of color behind it all. These new trends encompass everything from emerging technology, advances in content presentation, and new uses of pattern and color. Many of these cases are transferrable to different industries, spaces, and budgets. 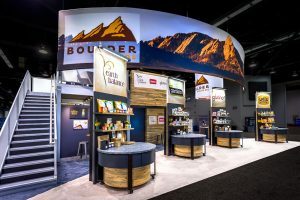 If you are looking for the newest trends in color and materials throughout the trade show industry, these different cases will spark your interest and have you thinking about ways to incorporate them into your own program. Cole creates programs that transform trade show booths into engaging marketing experiences. From pre-show outreach and e-marketing to promotions and in-exhibit activities, Cole’s campaigns draw, engage, and educate the target audience. Although he’s a millennial, he’s uniquely able to understand pretty much any audience’s unique characteristics and needs. His specialties include Brand Identity, Market Strategy, Mobile and Web Integration, Social Media, Art Direction, and Graphic Design. 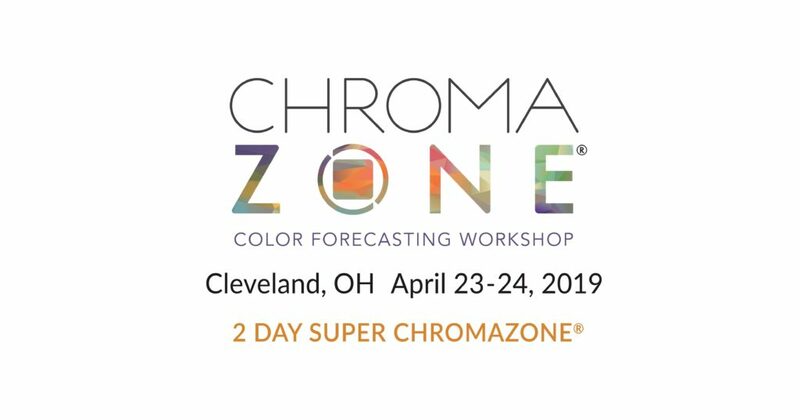 Date: Tuesday-Wednesday, April 23-24, 2019, 9:00 a.m. – 5:00 p.m.